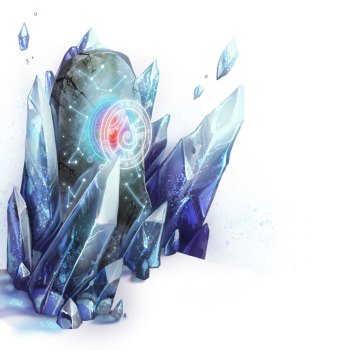 An enchanted glacial stone binds a powerful celestial glyph that extinguishes all dragon fire once freed from the ice. Once the dragon in question has its fiery breath frozen, the glyph continues to spew forth gusts of divine hail, encasing the dragon in a solid block of ice. The Glacier Ice Maiden Trap Skin can be used on the Ice Maiden. The weapon's stats (power, power bonus, attraction bonus, etc.) are not changed. The Glacier Ice Maiden Trap Skin may be made available at Ronza's Trapsmith and can be traded on the Marketplace or through Give To Friends. 25 July 2017: The Glacier Ice Maiden Trap Skin was introduced. This page was last edited on 9 December 2017, at 12:23.